As you would imagine, I and our various correspondents spend a lot of time on planes getting to where we’re going in Latin America. 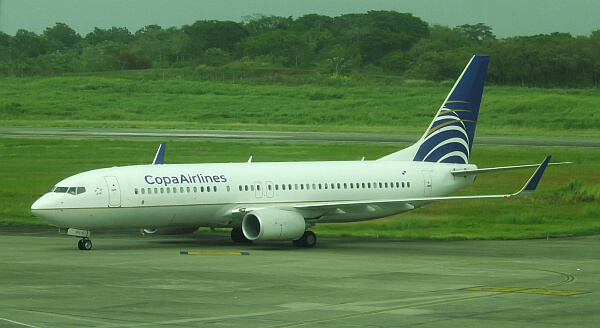 It’s becoming clearer each year that the airline of choice for this region is Copa Airlines. They are based in Panama City, which happens to be right smack in the middle between Mexico and South America. Like that capital, Copa considers itself the “hub of the Americas,” serving 74 cities in 30 countries. If you’re heading from North America to South America and will have to stop somewhere to change planes, your pilot won’t have to go far off your route no matter where you’re headed. 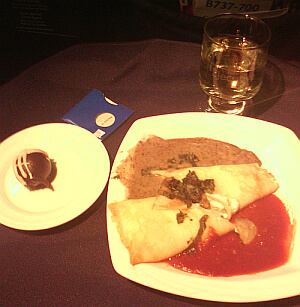 My most recent flight was to Costa Rica from Mexico City, with some of that in business class and some of it in economy. 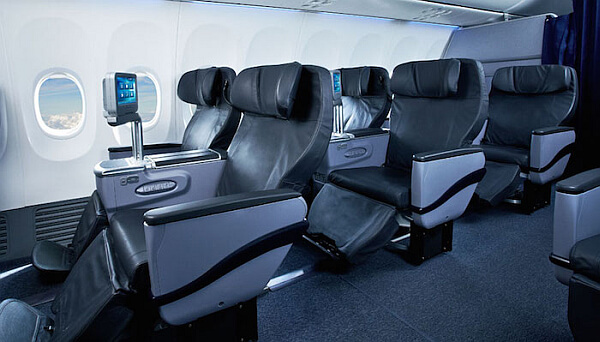 If you flew Continental before they merged with United, the cabins will feel familiar. The planes have a similar look and seat configuration. The two companies are still doing business together: the Copa Club Lounge in Panama City’s airport will make you feel like you’re back in a United lounge in Houston—because that company designed and operates it. Business Class won’t wow you with entertainment amenities, especially since even the largest jets have these little pop-up screens for each seat that come out of the armrest, but the service and food were both excellent. You usually only have 7 to 11 other people competing for the flight attendant’s attention. This is a “seat” though, not a bed: you’ll usually get wide leather and a 38-inch pitch plus a footrest, but you won’t sleep for eight hours like you can on some airlines that cross the Atlantic or Pacific. See individual flight maps at SeatGuru. For economy you’ll get a 31-inch pitch on pretty much every flight unless you’re lucky enough to snag one of the spacious bulkhead or exit row seats. Service is good though, with full meal service when flight time permits and complimentary adult beverages. For my four check-ins, time waiting in line was minimal and the boarding process moved quickly. I checked a bag (included in the ticket price) and my luggage arrived fine. One flight was late, the others arrived on time. Officially their on time arrival rate is above average at 90%. I know, we’re probably supposed to be agnostic and not express an opinion about which airline you should fly. That’s how the travel print magazines operate, not wanting to upset any potential advertisers, even as the flying experience gets worse each year. You’ll read lots about the good, but little about the bad in the big glossies. We don’t work like that though. We’ll fly on most any airline when needed, but the other operators have more issues. The U.S. carriers are just plain bad, which everyone knows at this point, front of the cabin or back. Their international flights are worse than most Latin American airlines’ domestic ones. LAN can be good at times and is really your only choice beyond Santiago in Chile, including Easter Island. They’ve got a reputation for having service personnel as gruff as their American Air counterparts though and they recently ranked as the stingiest airline around when it comes to using frequent flyer miles. You also have to take a time machine back two decades and call them or American on the phone to see if there’s any OneWorld alliance award availability. So, when we have a choice, we’re booking on Copa, especially if flying from one of the 12 U.S. markets they’ll have in place by September. Check your options here. I’d agree with you on this. I used to fly LAN more, but I tend to choose Copa now if the fares are similar. I still like AA/One World’s mileage building options better than the Star Alliance spending-based one, but it’s offset by the fact you can easily find award availability online. With OneWorld it’s almost impossible with a tedious phone call. 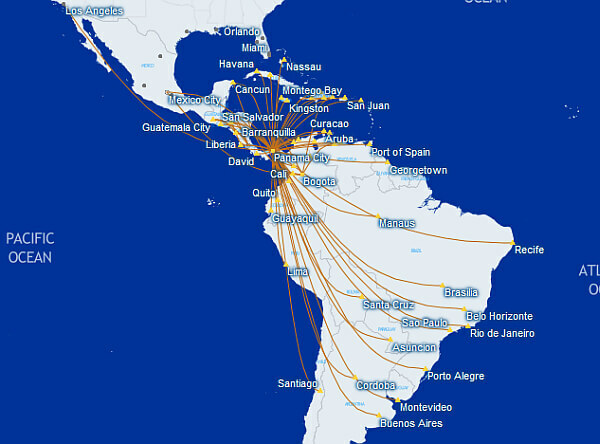 With Copa having its hub in Panama City, the layover doesn’t take you very far off the trajectory of where you’re headed.